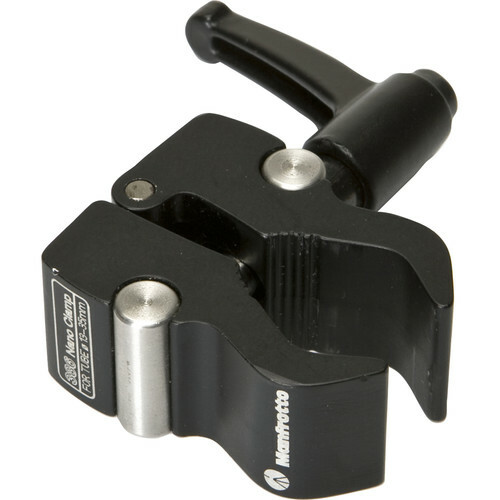 Clamping Range 0.5 to 1.37"
Small and light enough to carry in a jacket pocket, the Manfrotto Nano Clamp is like a mini version of the popular Super Clamp. Weighing in at just 4.4 oz and featuring a ratcheting aluminum handle, the Nano Clamp can support a load up to 8.8 lb. The clamp features a redesigned gripping surface, patented unexposed thread system, and high friction tape which improves the grip on pipes, poles, and tubes. This, and the fact that it incorporates 1/4"-20 and 3/8"-16 female taps, makes it well suited for use with a wide variety of lighting gear. Box Dimensions (LxWxH) 5.7 x 3.2 x 0.9"
Nano Clamp is rated 4.8 out of 5 by 11. Rated 5 out of 5 by Robert L. from Solid and Compact I needed a lightweight clamp, capable of securely holding a mount for a quick release plate, camera body and lens, 15 feet out from the face of a cliff on a boom. Clamp failure would be catastrophically expensive. I own several full-size clamps that would do the job but they are all too heavy for this application. After reading about breakage of similarly sized knock-off clamps I decided to pony up for the real Manfrotto clamp. Like everything I own from Manfrotto this clamp is bombproof. The nano clamp is just about perfect for this application and I am confident it is plenty strong. Rated 5 out of 5 by Charles from It clamps. What else you wanna know? Combine with the 244 Micro Friction Arm and you have a clamped articulating arm mounted on tripod neck for your dSLR video monitor...or in my case, Ninja Flame. Rated 5 out of 5 by Doug from Great Things Come In Small Packages This is an exceptionally well built clamp. I use it in conjunction with Matthews microGRIP rods and weighted base plate as a portable lighting system to hold a Streamlight Stylus flashlight on my audio follow cart for recording audio notes on film shoots. This little gem is a lifesaver for this build. Some may say it is pricey, but unless you have a machine shop to build your own clamps, trust me, this is a bargain! Rated 4 out of 5 by Benjamin H. from Very nice clamp Very light, small, powerful and affordable clamp! The only downside is that working under the sun the plastic grip it has to hold better to the surfaces fell off in a couple hours. Rated 5 out of 5 by Glen from Great little clamp with a lot of holding power I bought this to use to mount a Bluetooth speaker to the handlebars. This clamp does a great job holding this relatively large/bulky speaker in place with no shaking, slipping or any movement no matter what I am riding over. Make sure to buy a 1/4-20 or 3/8-20 threaded adapter if attaching to a standard female tripod mount point. This clamp accepts both sizes. My only issue is that when I used one of these for mounting my action camera to my handlebars, I could not control the direction of the camera since it just tightens on and then the camera is facing whatever direction it ends up in when tight. You have a bit of leeway but not too much or you will either damage the clamp/camera or it will be too lose and not stay in place securely. This is really a complaint about the options that exist for attaching this clamp to a camera though. I had to buy a little ball joint (BD-0 Mini Ball Head) to be able to set the exact direction the camera faces which makes it a more expensive solution. It would be great if Manfrotto had included a small adapter with a threaded locking ring that you can tighten down to secure the attached device in whatever direction you want. Rated 5 out of 5 by Bruce from Holds fast I clamp these to my tripod legs and attach a Magic Arm to support my slider. Locks tight, easy to change position. Rated 5 out of 5 by Dion Photo from Works like a charm Works just for what we needed it for and built well. Thank you so much for replying but to be clear, did you add the rubber pads from the B&amp;H link above to the inside of you Nano clamps? Because I need to Know if they fit and can be glued in to add protection. The current thin sheet that is in the Nano clamp keeps falling out and I want to replace it with something better. Thank you.